Nighttime lane closures at Northeast 20th Street and 136th Place Northeast. 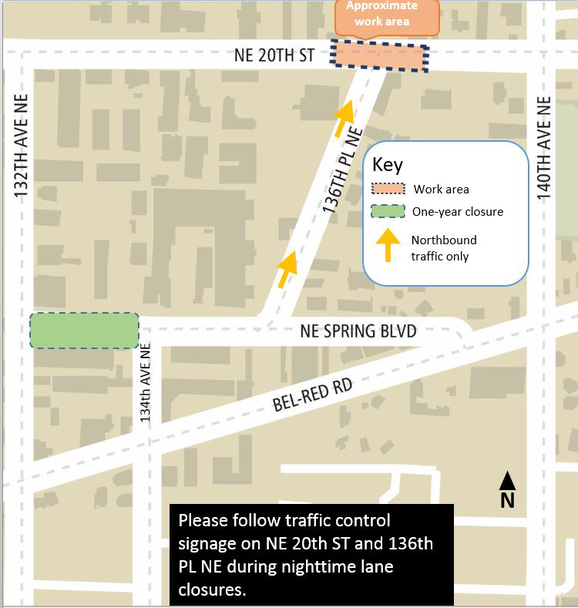 Starting as early as Tuesday, Sept. 4, and lasting through the morning of Friday, Sept. 7, Sound Transit contractor crews will perform nightly lane closures at Northeast 20th Street and 136th Place Northeast. These nightly closures are necessary to facilitate potholing and other exploratory construction activities. Nightly lane closures at Northeast 20th Street and 136th Place Northeast (recommended detours will be signed and in place). Work will occur from 8 p.m. – 6 a.m., Monday – Thursday. Local access will be maintained on 136th Place Northeast.